Gujarat State Child Protection Society Social Worker Recruitment: Application forms are invited by the District of Gujarat State from energetic and dynamic candidates to fill up total 149 Vacancies of District Child Protection Officer, GSCPS Security Officer, Legal co Probation Officer, Counselor, Social worker, Accountant, Data analysis, Data entry operator, Outreach Worker, Manager / Coordinator, Nurse, Doctor etc Jobs on contractual basis for a period of 11 months. 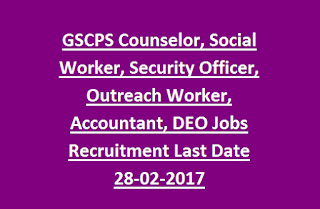 Interested candidates may send Application forms to the Address of "Gujarat State Child Protection Society, Block 19, Third floor, Dr Jivraj Mehta Bhavan, Sector – 10, Gandhinagar – 382010, Gujarat" on or before 28th February, 2017. Selection Process will be based on their performance in Written test and interview. 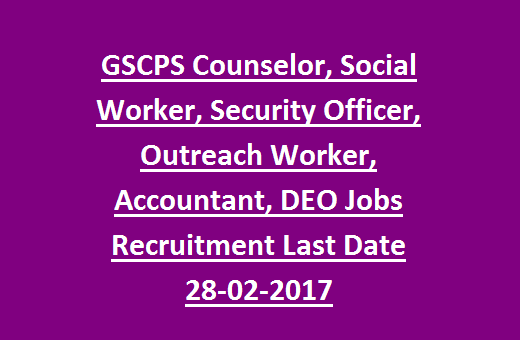 All details of Gujarat State Child Protection Society Security Officer, Accountant GSCPS Recruitment 2017 mentioned below. 1. Closing date to send Application forms is 28th February, 2017. 2. Issue of GSCPS Recruitment 2017 Admit Card will be notified soon. 3. Tentative GSCPS Recruitment 2017 Written Exam date will be updated soon. As per Gujarat State Child Protection Society Social Worker Recruitment 2017, total Available Vacancies are 149. Educational Qualification for candidates must be 10th passed, 12th passed/ graduation/ post graduation from a recognized university with good academic records to apply for GSCPS Recruitment 2017. Please visit Official Notification in detail to get Educational Qualification. Age Limit for candidates must in between 21 years to 40 years as on the last date of receipt of Application forms to apply for GSCPS Recruitment. Gujarat State Child Protection Society Security Officer, Accountant Recruitment will be based on their performance in Written test and interview. Interested candidates may download Application form for GSCPS Recruitment 2017 from Official Website and send the completed Application form along with the documents of Educational Qualification, birth certificate, caste certificate etc to the below Address on or before due date of 28th February, 2017.